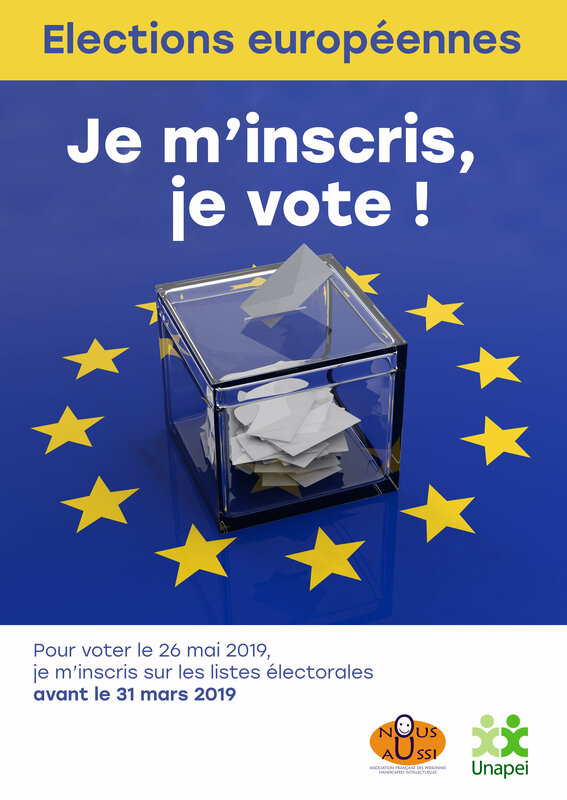 Make the most of the 2019 elections to the European Parliament! The elections to the European Parliament will happen in May 2019.
if there will be progress on their rights during the next years. 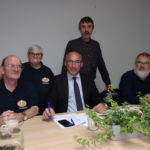 on how to make the most of the European elections in 2019.
self-advocates, family members and all other activists and European Union citizens. 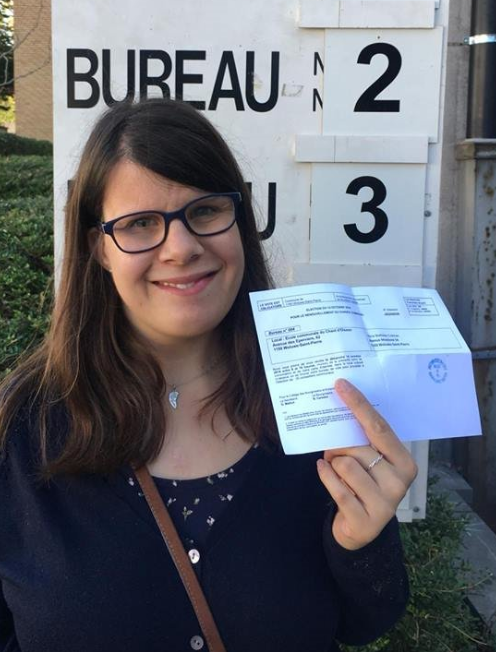 Self-advocate Mathilde Cotman voted at the Belgian municipal elections. She will vote again in 2019! Part 1: Why are the European elections important? The third part is for political parties and their candidates. It is also for authorities in charge of organising elections, to help make elections more accessible. Why are the European elections important? In May 2019, there will be elections to select new Members of the European Parliament (MEPs, for short). for people with intellectual disabilities and their families. of all European Union (EU) citizens. MEPs make decisions about laws. or the right to travel, live, and work within the European Union countries. for many activities and projects in European Union countries. Members of the European Parliament help to select the European Commission’s President and Commissioners. Commissioners are responsible for topics such as employment, social affairs, justice, education, and health. on the Rights of Persons with Disabilities (CRPD). is very important to you. It is important to all of us in the inclusion movement. You have a vital role in helping make this happen. to provide clear and accessible information. people with intellectual disabilities and their families. and you should tell others to vote too. The right to vote is very important. and also the future of the European Union. This is wrong and must be changed. or to communicate their decision. the time or resources to go to the voting station. Things like this have been improving in many countries. of the opportunities that come with the European elections. 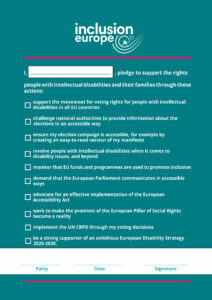 The European Union is important for people with intellectual disabilities and their families. There is a lot of talk about how the European Union works and if it is good to be part of it. because they say it does many things they do not like. because they say it does not do enough of the things they would like it to do. and we take them seriously. in the European Union over recent decades. The quality of life for many people with intellectual disabilities and their families has improved too. thanks to the work of the European Union. in the European Union has been improving. especially for people with intellectual disabilities and their families. Life for many people has been even harder following the recent economic crisis. to improve the quality of people’s lives. Progress on rights and inclusion. The European Union is based on human rights. towards making sure these rights are fulfilled. 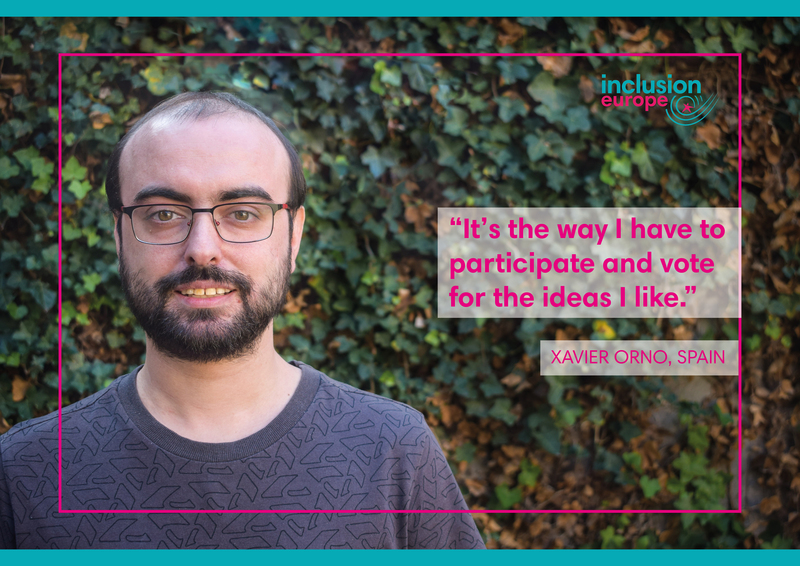 We always strive for more progress towards inclusion. that have already been made. Talk to the candidates in elections to make them aware of your opinions. and that they should participate in them too. Help your friends and colleagues understand more about the elections and take part in them. to keep and strengthen your rights in Europe. and others prepare for the elections. 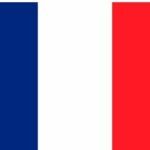 Find out about the parties and the candidates in your country. Call them and ask for a meeting. Tell the candidates to provide clear and easy-to-understand information about the elections. Ask them what they want to do if they get elected. Tell them about easy-to-read and why it is important. Tell the candidates to meet people with intellectual disabilities and their families. This could mean visiting people with intellectual disabilities at school or at work. Or there could be a specific event where the participants can ask the candidates questions. 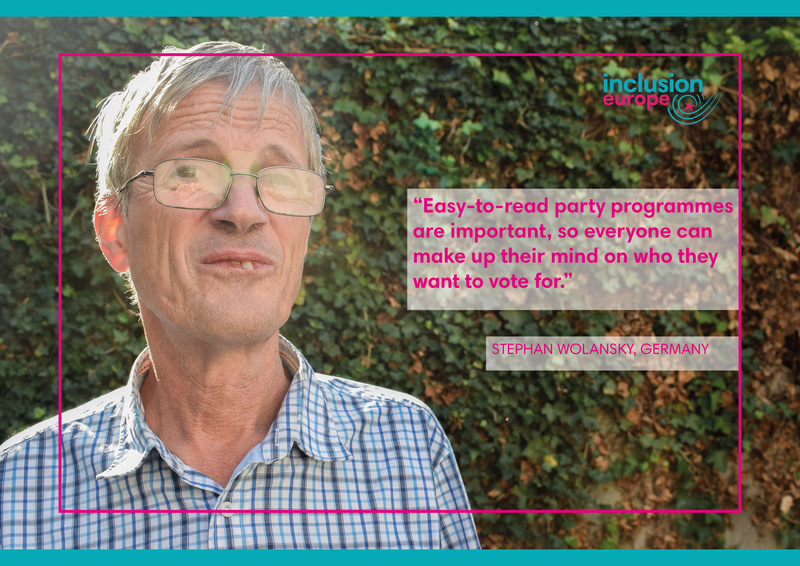 Tell the candidate to do things that are important to you and other people with intellectual disabilities and their families. on the 2019 elections to get ideas. 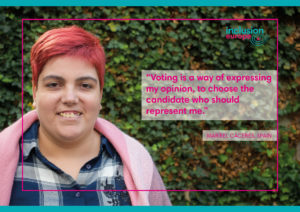 You can add your own ideas to make it more relevant to the candidates in your country. You can also tell the candidates how you can help them. For example, you can tell other people about candidates who care about what you have to say. and how they engage with you and other people with intellectual disabilities and their families. Get together with other people to talk about the elections. and how the MEPs can influence your life. Ask them to vote in the elections. Work together to appear in the media and make your voice heard. about the accessibility of elections and the right to vote. between 23 – 26 May 2019. Every country can choose on which of these days it will hold the elections. What Inclusion Europe thinks the candidates and parties should do for the European elections 2019. There are 7 million Europeans with intellectual disabilities. Altogether, we are more than 20 million people. from society on a daily basis. from going to school with their friends and neighbours. related to getting a job. 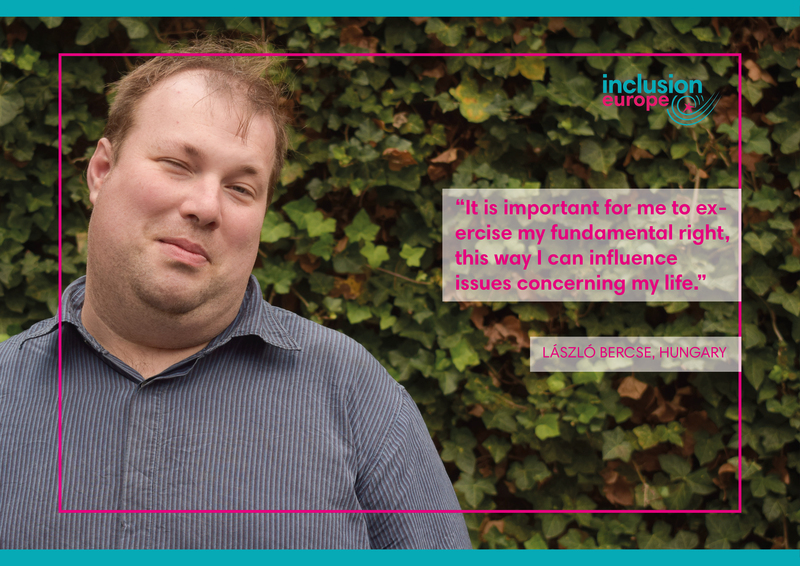 Hundreds of thousands of people with intellectual disabilities live in institutions, segregated from society and without a chance to lead a life as part of the community. Very often, family members are left to provide all support and care for their relatives with intellectual disabilities, because there are not enough support services. and suffer poor health as a result. 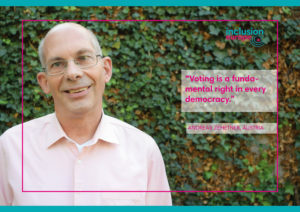 people with intellectual disabilities their right to vote. This is wrong and must change. 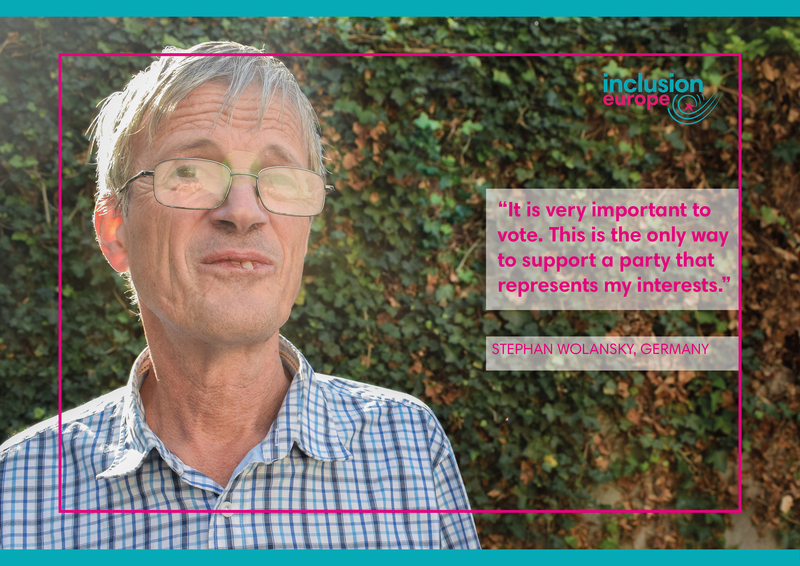 is not taken away from people with intellectual disabilities, many find it hard to participate in elections. and to listen to them. and not given in an accessible way. with intellectual disabilities and their families. to reach out and persuade the general public to vote. to argue that the voice of the MEPs is less important. We want as many people to vote as possible. We talk to people to tell them to vote. of people with intellectual disabilities and their families. and their families, who make up more than 20 million European Union citizens. Provide clear and accessible information. Deal with issues that are important to people with intellectual disabilities and their families. 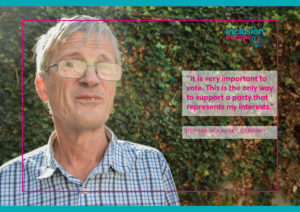 Organise discussions including people with intellectual disabilities and their families so you can listen to their views – and explain your own. at work or school, to gain an idea of their lives. Make sure you talk with people with intellectual disabilities directly, not only to their support or care staff. in their lives, and where would they like to live. Include people with disabilities in everything you do. When organising a meeting about disability related issues, always include people with intellectual disabilities. Refuse to take part in such meetings if they do not include people with intellectual disabilities. Organise meetings at times that are convenient for those who care for their family members. Provide care support so they can take part. 2. Provide clear and accessible information. Better still, provide an easy-to-read version. for everyone, not just people with intellectual disabilities. Get in touch with organisations that help with accessible information. Learn more about easy-to-read at www.easy-to-read.eu. Let people know who can vote, when, where, and how. and the candidates in the run-up to the election. Remove barriers that prevent people from voting. Take the voting to where people live. Make sure polling stations are marked in a way that is easy to understand. Make sure polling stations (including the voting booths) are also accessible to persons in a wheelchair. Make sure there is assistance available during voting. to the voting booth if required. for those who cannot get to the voting station. This includes family members who care for their relatives with disabilities and who will have difficulties finding time and resources to go and cast their vote. Implement the UN Convention on the Rights of Persons with Disabilities through your voting decisions. Lead towards an ambitious European Disability Strategy 2020-2030.
to make their own decisions, and ending segregation. 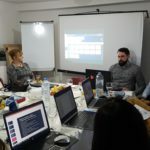 Improve accessibility in Europe by supporting the implementation of the European Accessibility Act and take additional actions to ensure that European services and products are accessible to everybody. 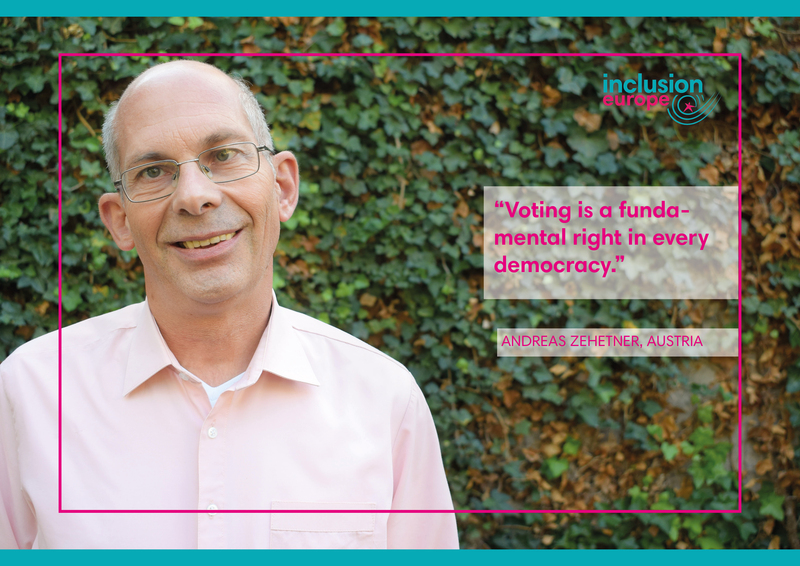 Remove restrictions on the rights of people with intellectual disabilities to vote and to stand for elections. and share your ideas on how they could be improved. to improve quality of life, as stated in the UN Agenda 2030. This includes reducing poverty and improving education and health. by the European Pillar of Social Rights. This includes providing inclusive education, skills-based training related to getting a job, and access to social security. 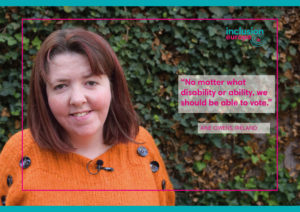 Ensure European funds promote inclusion and respect the rights protected by the UN Convention on the Rights of Persons with Disabilities. Ensure European Union funding is used to support the move from institutional care to community-based support. This includes providing adequate support to people who are leaving institutions to live in the community. Ensure programmes such as Erasmus+ are used to strengthen inclusive education. in everything you do that involves people with disabilities. Refuse to participate where people with disabilities are not included in the creation of law and policy that directly affect them. for everyone, as well as written information and consultation processes. – even when they are not about disability. What can you do for the European elections? Voting for all! How to make elections easier to understand and take part in (.pdf). 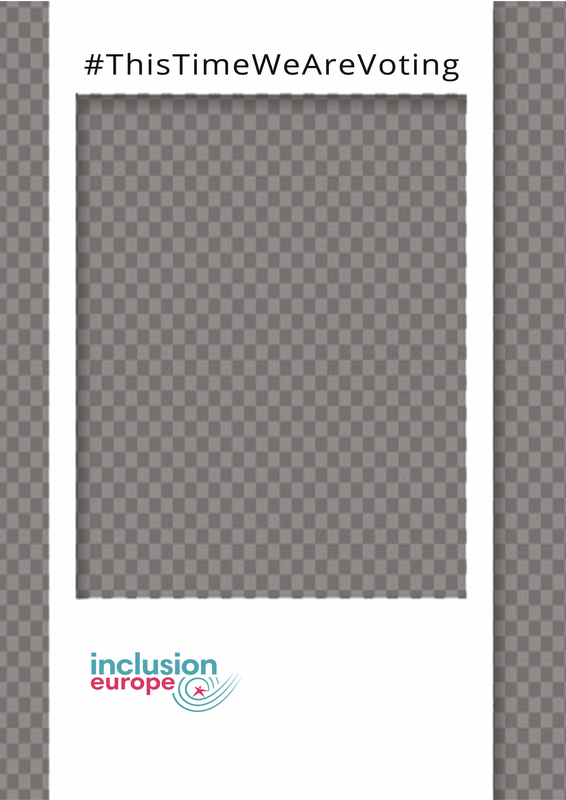 This document shows national inclusion organisations they can do in the run-up to elections to ensure that they are as accessible as possible, by the provision and effective dissemination of accessible information and by raising awareness amongst politicians, electoral bodies and citizens themselves about the importance of accessibility measures and full participation of all citizens in elections. 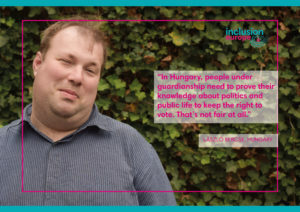 Recommendations for Accessible Elections in Europe (.pdf) covering five key areas: legislation on legal capacity, accessible information, training, support for decision-making in voting, and access to the voting process. 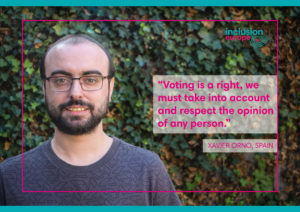 Good Practices for Accessible Elections (.pdf) in Europe. Inclusion Europe asked its members: What is the situation in your country when it comes to voting rights and the right to be elected? In 12 countries, people under guardianship are not allowed to stand for elections. In 8 countries, they are allowed to stand for elections only under certain limitations. In 7 countries, they are allowed to stand for elections without restrictions. It is difficult to get numbers for how many people are excluded from voting or standing for elections. However, there are numbers available for some countries. In Hungary, it is 50.000 and in Romania, more than 70.000. 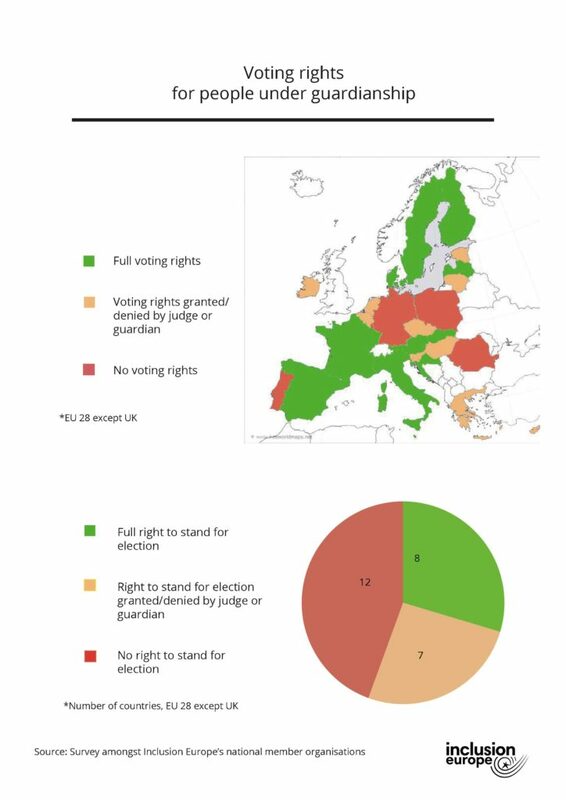 There still needs a lot to be done so people under guardianship enjoy full voting rights and the right to stand for election everywhere in Europe. 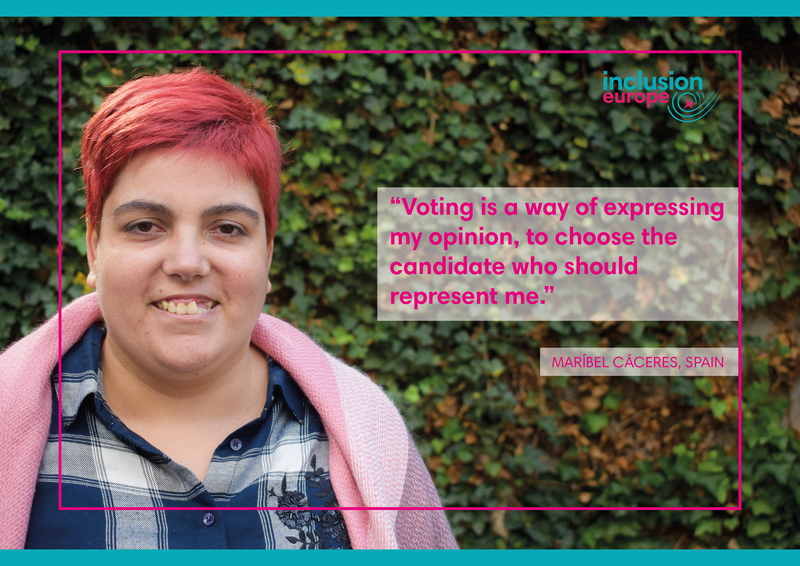 That’s why we say: #LetUsVote ! 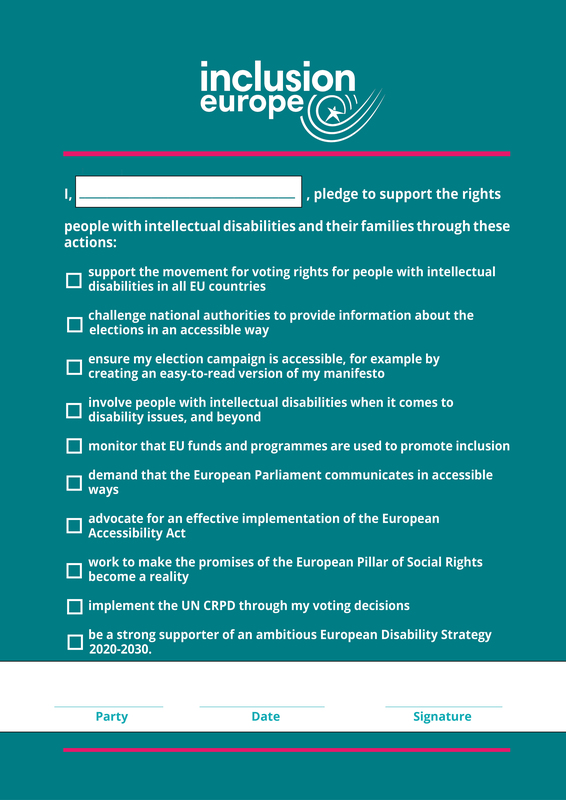 We wrote a pledge with our main demands towards the candidates for the European elections. Please feel free to approach candidates and ask them to sign the pledge! We developed a nice graphical version that you can use for this purpose. You can edit it if you have a picture editing programme. There is also a Word version available here. Don’t forget to use the hashtag #ThisTimeWeAreVoting when sharing a picture of the candidate who is signing. 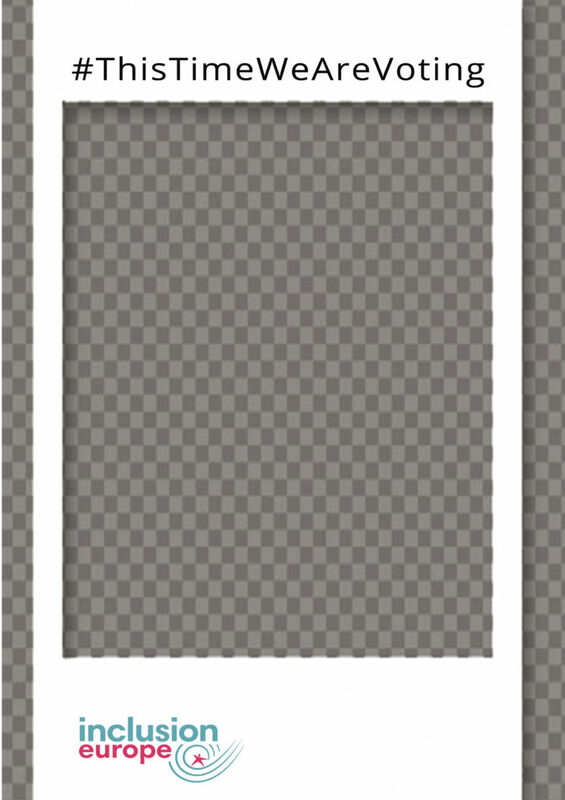 Here are 2 frames that you can use for your campaign! You can may also download them in pdf format, here in A3 and here in A1.